Big E Welcome --- What is it? The Big E Welcome is a 3 day experience that will prepare all first-year students for the collegiate experience both inside and outside of the classroom. 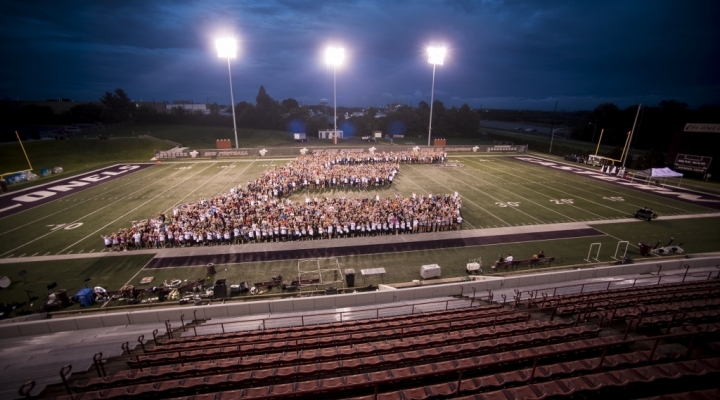 The Big E Welcome will allow you to build friendships and connections with other first-year students, equip yourself with skills to excel in the classroom, and truly welcome you into the EKU experience. Big E Welcome --- When is it? Who participates in the Big E Welcome/Is it Required? The Big E Welcome is mandatory for all first-year students (including all on-campus residents and commuter students.) Transfer students with less than 30 credit hours are expected to attend. Transfer students with more than 30 credit hours and Regional campus students are welcome to attend the Big E Welcome but will need to email Brandon.mandigo@eku.edu to sign up for the program. Do I need to pay any fees for the Big E Welcome? The Big E Welcome is free for all first-year students. What if I can’t make it to all or part of the Big E Welcome? Students that are unable to attend all or part of the Big E Welcome will need to contact Student Life & First-Year Experience by emailing fye@eku.edu. How is the Big E Welcome different than Orientation? The Big E Welcome will take place the 3 days prior to the first day of the Fall Semester. The Big E Welcome will allow you to build friendships and connections with other first-year students, equip yourself with skills to excel in the classroom, and truly welcome you into the EKU experience. Orientation is another EKU required program which occurs over the summer. At orientation, students will meet with an advisor, and register for their Fall Semester classes. For more information about orientation, please go to http://orientation.eku.edu/ or contact the Admissions office. When do I check in for the Big E Welcome? On-campus residents will check into the Big E Welcome when they arrive and check into their residence hall (please arrive to your residence hall during your assigned move in time.) Commuter students will receive detailed information via their EKU email as to where to check in before they arrive the first day. I’m living off campus. Is the Big E Welcome for me? Where can I park? The Big E Welcome is mandatory for all first-year students (including all on-campus residents and commuter students.) Transfer students with less than 30 credit hours are expected to attend. You can park in any designated Commuter Lot during the Big E Welcome. How do I get around on campus? Walking-You will be walking a lot during the Big E Welcome (please see disability accommodations below if you need assistance.) Be sure to wear appropriate footwear. Big E Transit- we will be providing shuttles to different events during the week on a limited basis. We want to ensure the best Big E Welcome experience for all students. Please contact Student Life & First-Year Experience at fye@eku.edu by August 6th to ensure we provide you with any needed accommodations during the Big E Welcome. What do I need to bring for the Big E Welcome? Are meals included during the Big E Welcome? During the Big E Welcome, students will eat all meals in the Case Kitchen located in the Case Dining Hall. For more information on meal plans, go to http://colonelonecard.eku.edu/dining-service-meal-plans or contact the Colonel One Card Office. Can parents or guests attend the Big E Welcome events with their student? Family members are encouraged to help their students get settled into their new living spaces, and perhaps make a trip to the store to pick up any last minute items or grab something to eat before the Big E Welcome starts. After that, it’s time to say goodbye. Families, you can leave campus knowing that EKU Faculty & Staff are working hard to support your students as they make the transition to college life. There are workshops that parents and guests are encouraged to attend on the first day of Big E Welcome. I am transferring to EKU. Can I participate in the Big E Welcome program? Yes, Transfer students with less than 30 credit hours are expected to attend the Big E Welcome. Transfer students with more than 30 credit hours and Regional campus students are welcome to attend the Big E Welcome but will need to email andrew.pendleton@eku.edu to sign up for the program.